If I had to pick one word to describe book two in The Artists Trilogy it would be transformation. First, if you haven’t read the 1st in the series, Sins & Needles, stop here. Don’t go any further until you do. 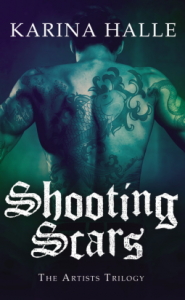 You need to read it in order to understand what’s happening in Shooting Scars. Book two picks up right where book one left off, and we switch back and forth perspectives between what’s happening with Ellie and what’s happening with Cameron. Ellie is forced to deal with her not-so-buried past with Javier while Cameron puts his messed up ex aside and teams up with Gus to track down Ellie. It’s painful at times, but OH SO WORTH IT. Ellie has pretty much hit as rock bottom as she can go, and I look forward to seeing where she goes from here. Watching her try to deal with her feelings with Javier, both past and present, is fascinating, though gut wrenching. I still don’t necessarily like Ellie, but I root for her regardless. I want her to figure out her sh*t and get straight, but the thing with Ellie is…what really is straight? Then there’s Cameron. Oh Cameron, Cameron, Cameron. He takes a page straight from Walter White in Shooting Scars and we see a dark, dark side of this man he himself has only barely come to grips with. Despite how completely screwed up Ellie is and how much she hurts him, he continues to find a way to stand his ground while remaining a pillar for her. It’s safe to say if these two manage to make it out alive of the incredibly ridiculously evil cartel situation they’ve embedded themselves in, they probably won’t recognize themselves. There’s few things better than tortured characters untwisting themselves, and Ms. Halle has gotten them all sorts of tangled. The Artists Trilogy continues to be chocked full of suspense, romance, and heartache. This is definitely a series to check out and stick with. I look forward for what’s to come for Ellie and Camden.